Slack supports both regular Unicode character entries for emoji, as well as short alpha codes which are converted into an emoji image when posted. Users of iOS and macOS see native (Apple) emojis in Slack. 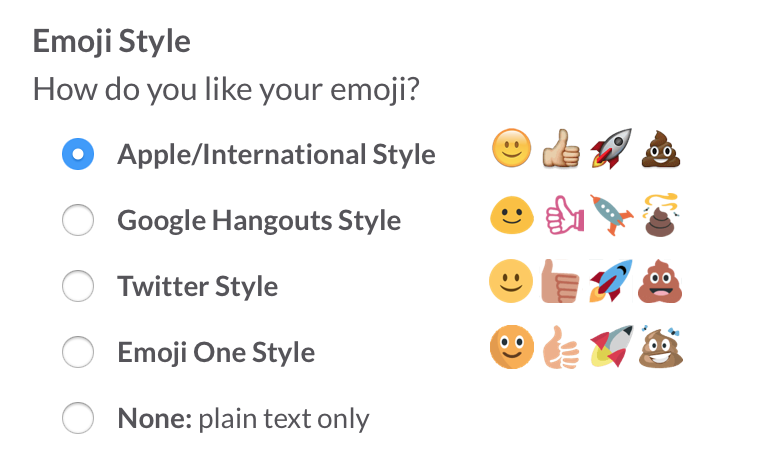 All other platforms display emojis in Slack using Google's Noto Color Emoji designs. This includes users on Windows, Linux, and Android. Slack previously defaulted to using Apple emoji images and provided user-level preferences to choose from alternatives such as Google, Twitter or EmojiOne. The setting to change emoji style was previously under the Preferences option inside the Team menu. This was discontinued in February 2018. In addition to regular emoji use, reactions are also available. This allows any emoji to be chosen as a response to a message. Reactions are tallied if multiple users apply the same emojis. The following codes convert emoticons into emoji images on Slack.